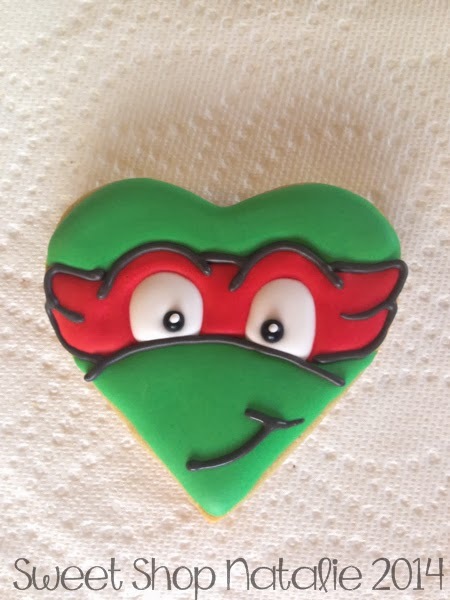 My son had TMNT valentines to give out this year and so I wanted to do cookie to go with as his favor. 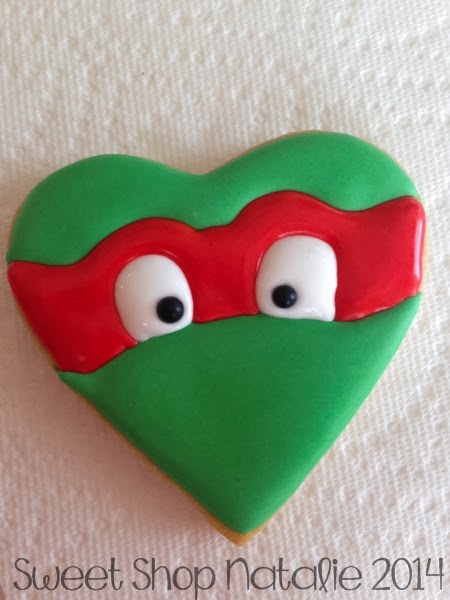 I have seen lots of TMNT cookies but wanted to just do a simple face and not the whole thing. 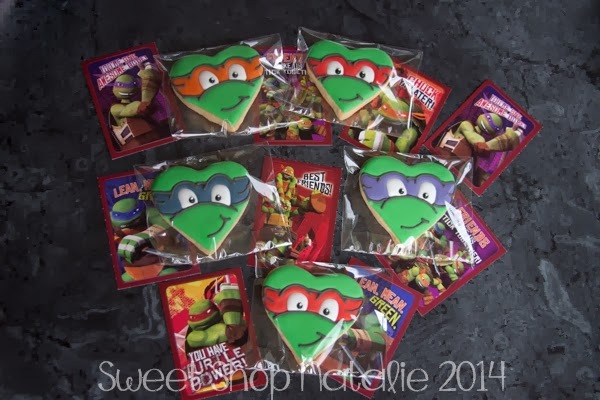 Some other cookiers gave me ideas and I was just going to do it on a round cookie but then I saw this post on the Semi Sweet blog and knew I had to do heart TMNT's. I thought I would share my process this time. 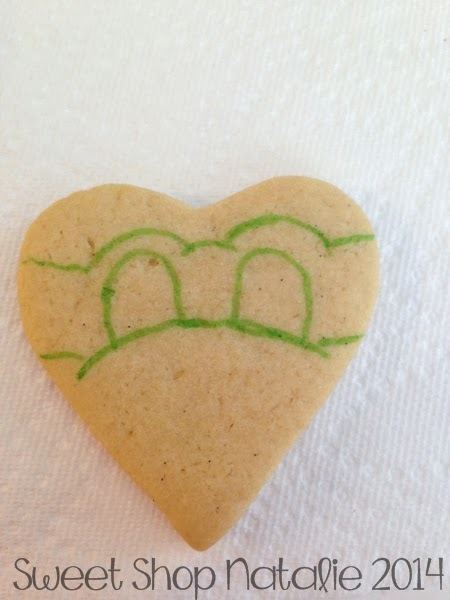 First make your dough, roll, cut out heart cookies. Find a picture of a turtle you want to use. 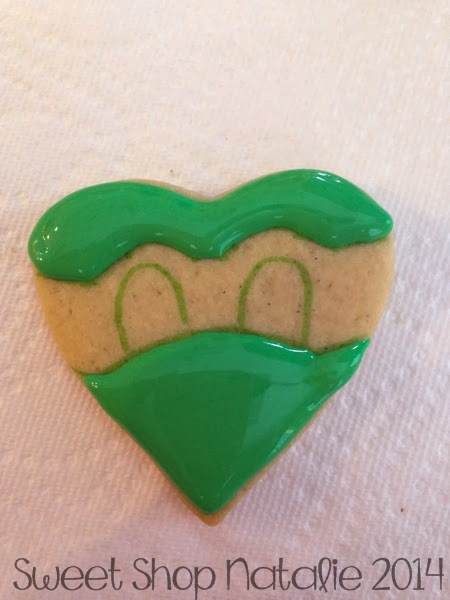 I used my KopyKake to trace image of mask onto the cookie using a food coloring pen. 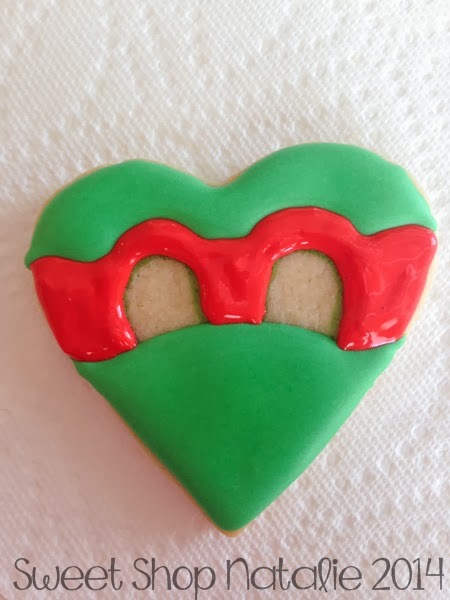 I could have just done the icing onto the cookie while under the KK but I think it is faster to just trace onto the cookies then put all cookies on a pan and then fill them there. Plus you don't have your KK running very long. 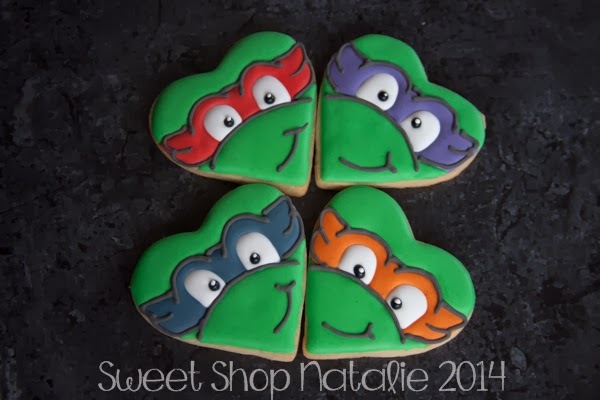 You could also cut out template of mask and trace onto cookie. Outline and fill in the green parts of the face first. Put under a fan for a few minutes to dry. 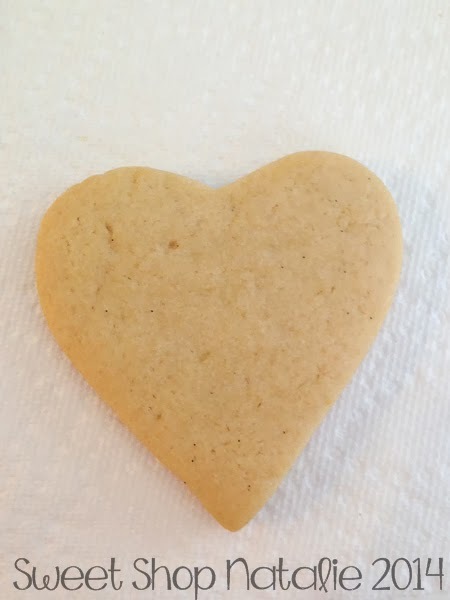 I was doing two dozen cookies, so I just did one step on all the cookies at a time by the time I was done with #24 I could do the next step to the first one and so on. Next fill with mask with colors red, yellow, blue and purple. Fill in the eyes with white. Now here you could use black icing to make the eyes but I just used CK black sugar pearls. Place in the candy eyes. Put a dot of white on the black for the eye shine. Let dry for about 20 minutes. Then pipe the details on with black piping icing. Let the cookie dry completely for a few hours or over night. Bag and you are ready to go! I made these early, sealed them and froze them. 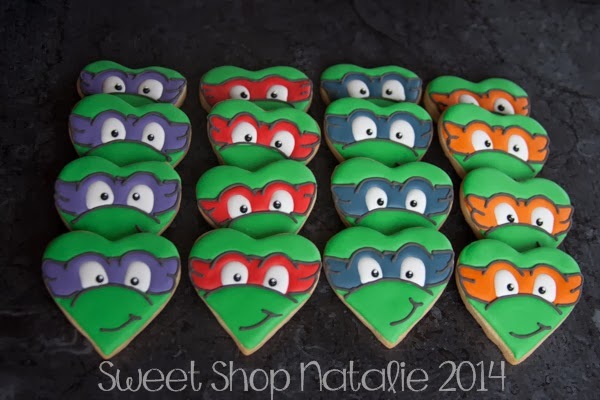 These cookies are to die for! 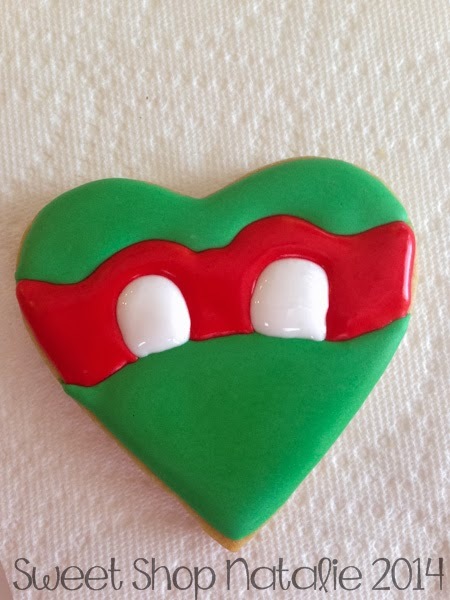 I am making them for my son to hand out to his preschool friends. Thanks so much for the tutorial! Thanks so much. I hope that they turned out awesome for you!! Thanks for this!! 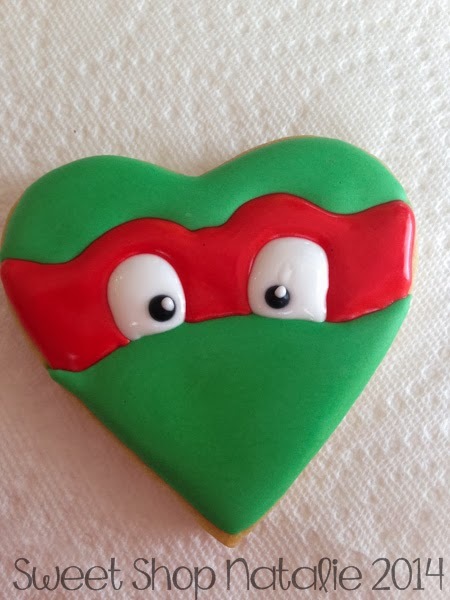 I was looking for a simple design for a little boy who loves them, Wish mines look as great as yours!! I hope it works for you. I am sure they will look amazing! !